Borregaard Bioplant ApS and Biobest NV today announced the closing of a transaction under which Biobest acquires an equity stake in Borregaard Bioplant and its Swedish subsidiary Biobasiq Sverige AB. Steen Borregaard initiated his activities in the early eighties and established Borregaard Bioplant ApS in 1992. 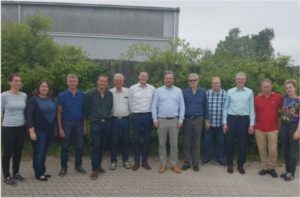 In 2004, the Swedish subsidiary Biobasiq Sverige AB was launched and subsequently Borregaard Bioplant has become the leading supplier of biocontrol solutions to the horticultural industry in Scandinavia. For Biobest, this transaction further strengthens its presence in direct distribution activities in a promising Scandinavian market. The values and vision of Borregaard Bioplant are well aligned with those of the Biobest group. A strong capability to advise customers worldwide on sustainable crop management is what fuels the company’s long-term growth. For more information please contact Lise Verachtert (lise.verachtert@biobest.be).